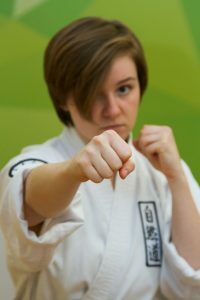 Karate classes throughout Kent for Kids and Adults. All childrens training sessions last 45 minutes Adults training session are for a hour or more. Please select any one of the Karate classes on the list below and come along for your first free lesson. For further information please contact Steve Martin 01634720098 or 07999346050. Alternatively contact us by email Info@Shizendo.co.uk or online here. What to do next, find your nearest karate class and come along for your first free taster session. What do I wear, the best clothing is a T shirt or track suit bottoms or shorts if you prefer. How long is the session, Children’s training sessions last 45 minutes, Adults training session are for an hour or more. What to expect, your first training session will be a basic overview of the first section of the syllabus. 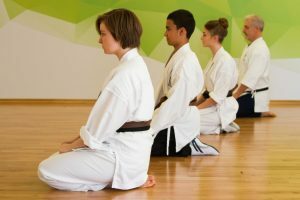 The children will be taught how to bow in the dojo (Training Hall) and Dojo etiquette followed by a warm up and basics. The child will be taught the four basic blocks two to the mid line one upper and one lower, two basic kicks, front kick and back kick. The adult first section is differing from the children’s and is as follows. The seven strike techniques are taught first these are the basic punches, the front jab, rear jab, cross punch, hook, upper cut, overhead and back fist. Two kicks are also taught, the front kick and angle kick. A foot work drill is also covered developing the eight directions in a forward stance. Do I need to be fit? No, the first lesson will be tailored to your needs, the training is conducive to learning and getting you fitter slowly developing your martial art skills. What do I need once I join; a licence is a requirement for all martial arts, Shizendo Karate starters pack, the starters pack contains Karate suit, belt, two badges, grading syllabus and club information. Grading’s, are held on a regular basis at Tonbridge Leisure Centre on a Sunday morning, you only grade when the standard is reached, your instructor will advise when you are eligible to grade. Karate Classes are managed by other Shizendo Instructors teaching the Shizendo system of karate. The chief instructor oversees the development and standards of both inhouse instructors and students of these clubs to maintain a level of quality. The instructors of the Satellite clubs have to attend regular training with the chief instructor to uphold their own standards of training which reflects in the students standards, standards are monitored on monthly grading’s by a select grading panel. For Dan grading’s the Technical Committee will be consulted for approval and date then set for the candidate to attempt the grading test. The Technical Committee is made up of third Dans and above.